Limited edition pays tribute to the founder of science fiction. With blue enamel and platinum accents. Includes a cap design that simulates a submarine window. This has turned out to be one of the most popular Writers Series issues possibly equaling the popularity of the Agatha Christie and Marcel Proust. 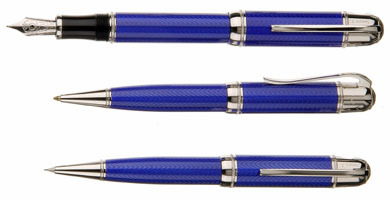 Beware there are identical fakes of the Verne with an incorrect total edition number engraved on the pen.